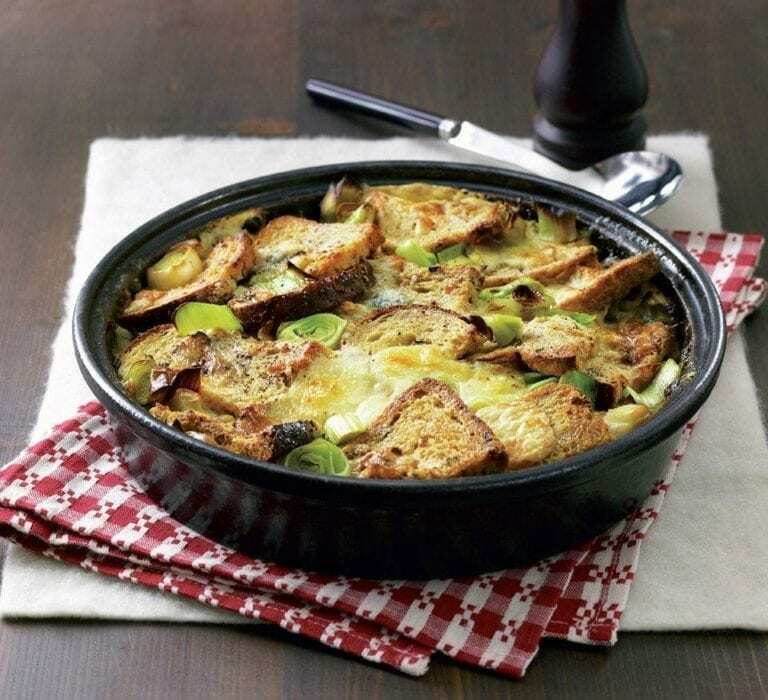 This cheesy vegetarian recipe is comfort food heaven and a savoury take on the classic British bread and butter pudding. Heat 10g butter in a large frying pan over a medium-low heat. Add the leeks and cook gently for 6-8 minutes, stirring occasionally, until softened but not coloured. Set aside. Meanwhile, thinly spread the remaining butter and the mustard on 1 side of each slice of bread. Cut each slice into quarters. In a large jug, beat the eggs, milk and some seasoning. Preheat the oven to 190°C/ fan170°C/gas 5. Arrange a third of the bread, buttered-side up, in an ovenproof dish. Scatter with a third of the leeks and a third of the cheeses, then pour over a third of the milk mixture, evenly and slowly. Repeat to use up the remaining ingredients, then leave to soak for 20 minutes or so, if you have time. Place the dish on a baking sheet and cook for 30-40 minutes, until risen and golden. Serve warm with steamed seasonal vegetables. For a meaty version, fry 6 chopped pork sausages until golden, then add to the leeks before layering up.